Did you know that three years after Napoleon's ambitious invasion of Egypt, France and Russia came very close to launching an even more ambitious invasion of British India? Following the French Revolution, other nations of Europe descended upon France with a series of invasions aimed at stopping the Revolution and restoring the monarchy. But by 1797, France had decisively defeated a coalition of Britain, Austria, Prussia, Spain, and various Italian states, thus not only ensuring the survival of the Revolution domestically, but also making large gains of territory which had eluded the Bourbon kings before it. In 1799, Britain and Austria organized a Second Coalition against France, and for the first time it included the participation of Russia. Russia's participation didn't last very long. Russo-Austrian relations deteriorated as a result of Austria's decision to evacuate Switzerland, which basically meant ditching the Russians under under General Korsakov there, and as a result they suffered defeat at the Second Battle of Zurich by Marshal André Masséna. As it turned out, Russia's policy of restoring the king of Sardinia and Austria's policy of territorial aggrandizement in Italy weren't quite compatible, and there was an incident where the Austrians apparently insulted the Russian flag at the Italian town of Ancona. It's not a surprise Tsar Paul became very hostile against the Austrians. The Russians also ran into problems with the British. Their joint expedition in Holland was a failure, and Paul was furious when the British siezed Malta, since he was the Grand Master of the Knights Hospitaller, a.k.a. the Knights of Malta. Finally, the British policy of unrestricted searching of neutral shipping for French contraband proved to be the last straw. Russia allied with fellow Baltic powers Denmark, Sweden, and Prussia in a decidedly anti-British alliance, the League of Armed Neutrality, which was meant to protect their neutral merchant shipping from the aggressive British Navy. By 1801, Russia was in a state of unofficial war with the British, who under the famous Horatio Nelson would in April brilliantly smash up the Danish fleet at the Battle of Copenhagen. Meanwhile in 1800, Napoleon, who had returned from Egypt, was making overtures of alliance with Russia. These included, among other things, plans for an expedition against India. The secret plan, known as the Indian March of Paul, called for one French and one Russian infantry corps, each numbering about 35,000 men, to meet up around Astrakhan on the Volga river delta on the shores of the Caspian Sea. The French were to get there by traveling from Europe down the Danube River, then across the Black Sea and up the Don and down the Volga via Tsaritsyn (later called Stalingrad, now called Volgograd). From Astrakhan, the combined Russo-French forces would sail the Caspian to the Persian port of Astrabad, and they would continue on foot over Afghanistan before finally arriving in India. 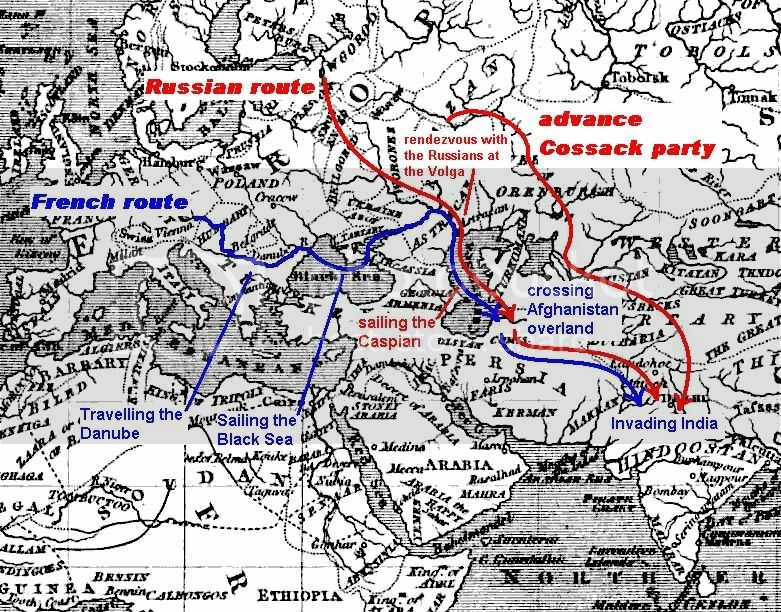 Meanwhile, a large Cossack contingent would be sent by an overland route through Central Asia, east of the Aral Sea. In total, the French advance from Europe to Astrabad was estimated to take 80 days, and the overland route across Afghanistan to take a further 50. The French expedition was to begin in May 1801, and that January, Paul ordered his 20,000 Cossacks to march in advance via Bukhara and Khiva. In the end, nothing came of the bizzare venture. In March 1801, Paul was assasinated and the invasion of India abandoned. His Cossacks had barely passed the Aral Sea when they heard the news and were ordered to return home. In the long run, British discovery of the Russian plan may have figured in the British hostility against Russia in the Central Asian cold war known as the Great Game. If there's anything we know about the imperial-era British, its their extreme sensitivity and alarm to anything that may even romotely threaten that precious Jewel in the Crown, "Hindoostan." Well I think that this is not that interesting of a post. I personally have heard of the mentioned incident. Also, Hitler, who was forever copying Napoleon, tried to do the same thing prior to launching Operation Barbarossa.